Thank you for being a part of our cooperative community! 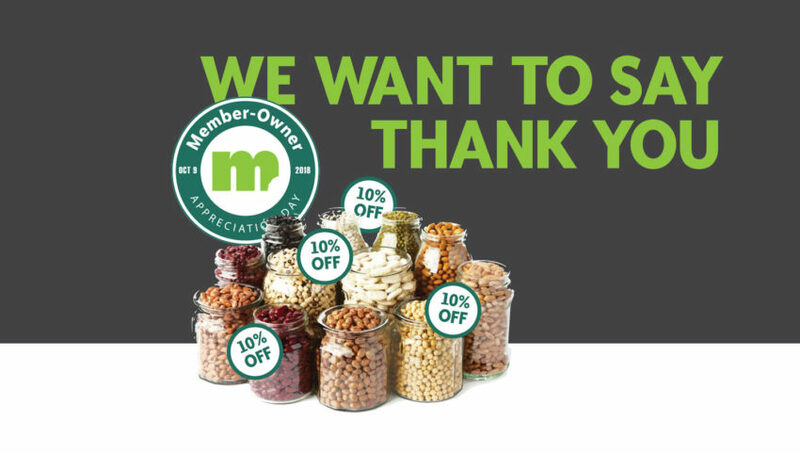 Join us Tuesday, October 9th, 2018 for our Member-Owner Appreciation Day Bulk Sale. For one-day-only, Mississippi Market member-owners will receive 10% off all bulk items*, including bulk spices, herbs, tea, coffee, cleaners, soaps, and lotions, at all three of our store locations. Mississippi Market continues to thrive thanks to the support of our dedicated member-owners. Because of you, we’ve been able to offer local and organic foods to our St. Paul neighbors for 40 years! Thank you for your continued commitment to values-based community building and sustaining a robust regional food economy. We wouldn’t be here without you! *Discount does not apply to non-discountable items (i.e. eggs, cut flowers, bulk produce items, bulk kombucha, cut-your-own soaps, and special orders). Can members use their coupons in conjunction with the discount? Yes! Quarterly 10% member-owner coupons and LIME program discounts can be combined with the Bulk Sale 10% off discount. Co-op staff who are member-owners may use their employee discount in conjunction with the Bulk Sale discount. Can people who become members the day of the sale get the 10% discount? Yes! New members who sign up on or before October 9th are eligible to participate in the Bulk Sale and will receive the 10% discount. What if a member shops in the morning and comes back again in the evening? Do they get the discount both times? Yes! Member-owners will receive the 10% discount no matter how many times they return or shop at any co-op store location on October 9th. What if a member wants a product that is out of stock? Can they get the discount later? No, there will be no rain checks. Can members of other co-ops receive the one-day 10% discount? No, you must be a member-owner of Mississippi Market to be eligible.